Thornton Hibs U19s recorded their biggest victory of the season at the Fleet Grounds in the League Cup with Ryan O’Donnell inflicting most of the damage with a well taken hat-trick. His first goal came in the 6th minute with a shot from distance that gave Jordan Copeland no chance. It wasn’t until the 27th minute that Thornton could find the net again, Archie Watson rising to head home Nathan Harley’s corner-kick. Three minutes later O’Donnell netted his second with a powerful shot into the roof of the net and shortly before half-time Travis McBride finished off a fine move involving Luke Smith and Jack Hoskisson to make the score 0-4 at the interval. Hoskisson went on a great run in the 52nd minute and his 25 yard shot was equally impressive to make it five but three minutes later, a lapse in concentration allowed Dylan King the opportunity to pull one back. Normal service was restored in the 75th minute when the Hibs re-claimed their five goal advantage after Harley’s cutback was perfect for Hoskisson to shoot low into the net. 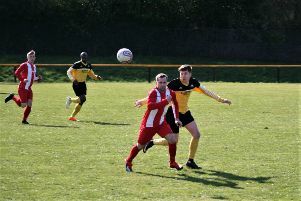 O’Donnell completed his hat-trick in the 78th minute when he raced clear and rounded the out-rushing Copeland before rolling the ball into the unguarded net. Reilly Campbell completed the rout in the 82nd minute when he converted Blair Munro’s corner-kick.